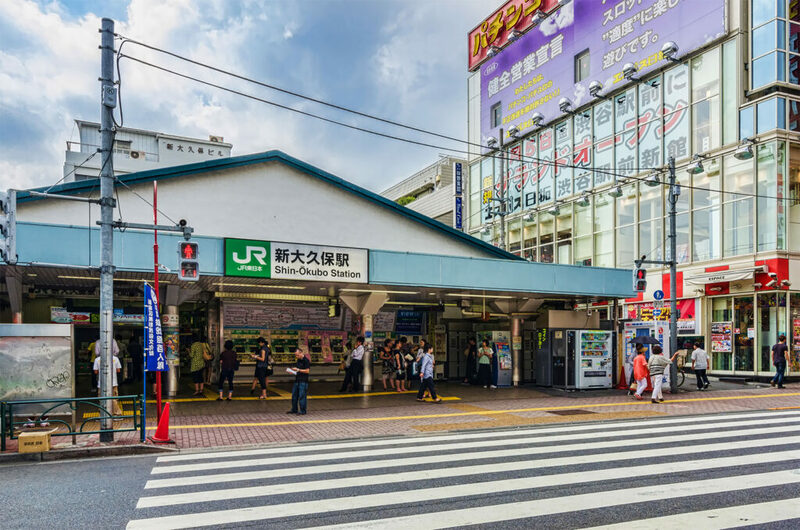 Shin-Okubo Station sits right in the middle of Koreatown and is a great way to experience authentic Korean culture in the heart of Tokyo. You’ve probably heard of Chinatown but what about Korea Town? That is what you will find in the area around Shin-Okubo Station新大久保駅・しんおおくぼえき (新大久保: 新 – new 大 – big 久 – long time 保 – to keep) as it is the biggest enclave of ethnic Koreans in Japan. If you’re looking for kimchi, ishiyaki bibimba石焼ビビンバ・いしやきびびんば, or good old fashioned 焼き肉やきにく・Korean barbecue this is the place to look. Take a walk down the Okubo Dori大久保通り・おおくぼどおり, the main road through the 近所きんじょ・neighborhood, to find dozens of restaurants that look and smell great! You can also find a number of shops selling Korean music and pop culture items. The Koreans in this area never let go of their language or way of life so a walk through the maze of side streets leading off of the main street is sure to provide you an adventure in Korean韓国・かんこく culture. If you fancy taking a university course the grounds of Waseda University早稲田大学・わせだだいがく and the Gakushuin Women’s College学習院大学・がくしゅういんだいがく are also just to the north east of 新大久保駅しんおおくぼえき・Shin-Okubo Station.